Udaipur is a beautiful land around the water lakes, surrounded by the Aravali ranges. The 'Land of Lakes' is epitomized by Lake Pichola, Lake Fateh Sagar and Lake Swaroop Sagar. It is the most romantic of all the destinations present in Rajasthan. Therefore, it is popularly known as the 'Venice of East'. The city is a great source of inspiration for poets and painters. The city seems to come out straight from a fairy tale. The lakes, palaces and gardens that adorn the city remind the visitor of the romance and chivalry of the bygone era. 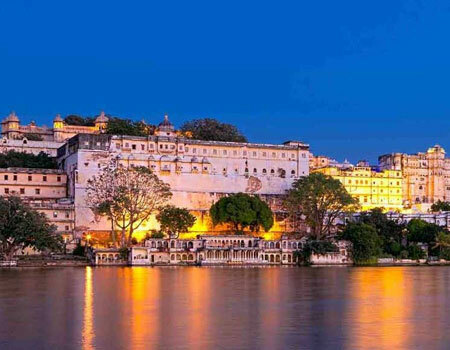 Udaipur is the jewel of the Mewar kingdom. The city was built by Maharana Udai Singh in 1568. Over the shimmering waters of the Lake Pichola stands the splendid City Palace. It is simply an architectural marvel built in granite and marble. The City Palace overwhelms the onlookers with its splendor. The beauty of Udaipur City does not make it merely a popular tourist destination. The city is a hot spot amongst the film makers as well. Some shots for The Jungle Book were filmed in Udaipur. Dabok airport, which is 24 kilometers away from Udaipur, is the nearest airport. Udaipur is connected to cities like Delhi, Jodhpur, Ahmedabad, Jaipur and Mumbai through regular flights. Udaipur is connected to cities such as Delhi, Jaipur and Ajmer through train services. Udaipur is linked to major cities like Ahmedabad, Delhi, Kota, Ajmer, Jaipur, Mount Abu, Indore and Mumbai through a wide network of bus services.